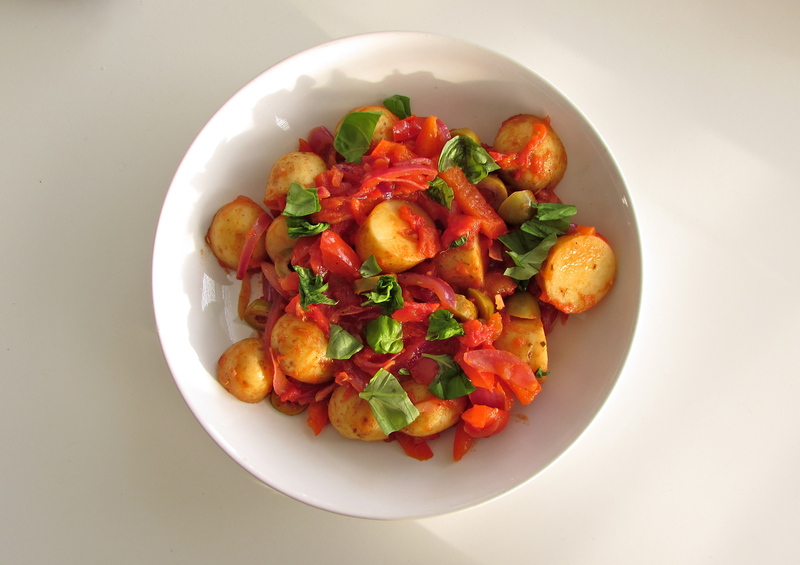 To celebrate National Vegetarian Week and the May Bank Holiday in the UK, impress your friends and family by having a go at making this wonderfully flavoursome Mediterranean potato, tomato and pepper salad. It’s really easy and cheap to make, looks exotic and appetising, and it’s low in fat! As the weather slow starts to warm up (if we can brush off this pesky rain), and you’re thinking of organising a barbecue, serve this salad as a summery side dish, or as an alternative addition to a veggie Sunday lunch. It can easily be doubled, tripled or multiplied further if you’re feeding the masses. 1. Half-fill a medium to large saucepan with cold water and sprinkle in a pinch of salt. Bring to the boil. 2. Pour the olive oil into a decent sized frying pan and put on a medium heat. Add the onion slices and fry for 5-7 minutes, until they begin to soften. 3. Meanwhile, when the water has boiled, add the potatoes and cook them following the pack instructions – which is usually around 15-20 minutes. 4. Add the garlic and oregano to the frying pan and and cook for a minute or so, stirring frequently. 5. Tip in the sliced pepper and fry for a further 5-7 minutes, stirring often. 6. Pour in the chopped tomatoes and season well at this point. Bring the sauce to the boil and simmer for 10 minutes, stirring occasionally. 7. Prod one of the potatoes with a knife and if it’s quite soft, they’re ready. Drain them over the sink using a colander. 8. Mix the potatoes and olives in with the tomato mixture and heat through for a few minutes. Give the sauce a taste and see if it needs more seasoning. 9. Serve the mixture in a large bowl. Tear the basil leaves into small pieces and scatter over the mixture. If you make this dish, I’d love to hear how you get on with it. Please feel free to leave a comment below. This recipe is based on BBC Good Food’s Mediterranean potato salad.